Elderberries fight the influenza virus and H1N1 while strengthening the immune system. They contain high amounts of Vitamin C and moderate amounts of vitamins A and B6 and iron. They are also mildly anti-inflammatory. The nation of Israel has completed several various studies on elderberries. The findings are surprising! Mumcuoglu, who is president of Razei Bar, first tested her research on patients in the Southern Israel flu epidemic of 1992/3. The results were extremely encouraging. Within 24 hours, 20% of those patients taking Sambucol had dramatic improvements in symptoms like fever, muscle aches and pains and coughing. By the second day, 73% were improved and by day three, 90%. In the untreated group, only 16% felt better after two days. The majority of that group took almost a week to begin feeling better. Of all the types of elderberries, we want Sambucus nigra. These are edible when fully ripe. Unfortunately, most elderberries are toxic and should not be eaten raw. 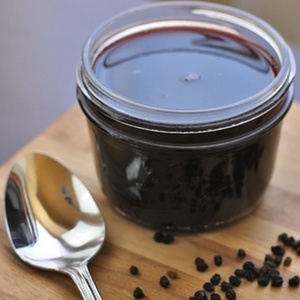 Once cooked, however, make any elderberries into jams, jellies, or even drinkable juice! Sambucus nigra is an exception to the all-raw-elderberries-are-toxic rule. Keep in mind that even Sambucus nigra must be fully ripe. For tincture making, don't cook your berries. And discard them once strained. Always avoid red elderberries. These are toxic, cooked or not. Purchase elderberries online at The Bulk Herb Store or Mountain Rose Herbs. Or, check your local health food store! Finally, making an elderberry tincture is simple! Here's the step-by-step process of how to make an elderberry tincture! Elderberries fight the influenza virus and H1N1 while strengthening the immune system. They contain high amounts of Vitamin C, in addition to moderate amounts of Vitamin A, Vitamin B6, and iron. They are also a mild anti-inflammatory. And, they are EASY to make into a tincture! Fill pint or quart jar half full with elderberries. Next, fill with vodka, leaving 1 inch of head space. Label jar for contents and date, place in a brown paper bag, and set in a dark cool area for 4 to 6 weeks. Once infusion time is up, strain through a fine mesh strainer, tea towel, or old clean t-shirt. Then discard the berries. Some folks eat the Sambucus nigra elderberries raw as these are not toxic when fully ripened. I personally chose not to do this, and I discard them. If you’ve researched it and feel safe eating them, rinse your berries after tincture making and add to oatmeal or granola. When your immune system is compromised or you’re coming down with the flu or a cold, take 1 teaspoon of elderberry tincture 3 times a day. Since tinctures can be rough to take straight, dilute in 8 ounces of water for easy drinking. Giving tincture to children? Place 1 teaspoon of tincture in hot water (think hot like for herbal tea). This will evaporate the alcohol. Once cool, give to the child to drink. Do you know how to make an elderberry tincture? What tips or advice would you add? Dear Katie – I just decanted this year’s elderberry elixir. I make it with elderberries, elderflowers, rose hips, honey and brandy with a couple of cinnamon sticks added to the mixture. That sounds amazing! Thanks for sharing with us. What a wonderful mixture you’ve put together. Jenny – you can use frozen elderberries. And gin is fine – I would use at least 40% ETOH for dried berries – haven’t made this with fresh berries but would go higher on the ETOH. I have the alcoholic “cordial” with brandy as well as the tincture with vodka. Sometimes I use whiskey. Also I tincture elderberry flowers separate from the berries. Hi Katie! How long after infusion, if stored properly, would you say the tincture maintains its potency? Thanks so much! Kelly, I would say at least a year, maybe two. I generally only make a pint worth and that will last us through the winter months. Then I start it again in the fall. I love finding natural remidies like this. i will have to make this and try this for this coming cold season. Tanya, let us know how it goes. I love to hear what others do with it. When I can get wild elderberries, there are 3 things I do with them. First, I gather the “elder blow”, which are the little white flowers, when they start to be loose on the plant. I spread those out and let them dry. Then, if I feel a cold coming on, I make “tea” from a teaspoon of the dried blossoms. It is as if it makes me have a very small, and very short fever, and the cold will go away and leave me alone. The elderberries themselves, I either bake into muffins, or steam juice them. Then I take that juice and combine it half and half with honey and can it to use like a syrup to ward off colds and flu. A Tablespoon, 2 to 3 times a day generally does a good job. Thank you for sharing with us Yolanda! I’ve never seen them wild where I am, but then again, I haven’t looked too closely either. I would love to happen upon a some. Amy, you are probably right. But since I’ve personally never ate them, I’m leery to tell other too. I know many who have and declare them safe though. What if you don’t want to make Vodka tinctures but glycerine. Will you post how to do it that way? I feel very uncomfortable buying liquor. I personally have never used glycerin to make a tincture. But I completely understand why you wouldn’t want to purchase liquor (it’s normally something I send my husband to do). From my research glycerin tinctures use 1 part water and 1 part glycerin. So follow the method in the post above but substitute the vodka with 1 part water and 1 part glycerin. Let us know how it turns out. Dara I am new to tincture making also. From what I gather the alcohol is absorbed into the liver for better health, detox and blood cleaning benefits, whereas the water & glycerine method will bypass the liver and fight on a different level. Has anyone else seen otherwise? I’ve been told that alcohol pulls the “good stuff” out of the herb better than glycerin and has a longer shelf life, so if using glycerin, I suppose you’d use a somewhat larger dose. I use alcohol tinctures by the drops, under the tongue. It’s more quickly & efficiently absorbed, I guess. Hi, I am really excited about trying this. I bought and used dried elderberries for a cough syrup which was delicious and useful. I have extra, but I didn’t realise you should freeze or refrigerate them to keep them fresh and I was wondering if anyone knows if I can still use them? They don’t show the usual signs of spoiling (funny growths or smells) but should I just toss them and purchase more? Thank you to anyone who can help! Shelbie – if they smell fine I would definitely use them. I don’t refrigerate my dried herbs or berries – have had dried elderberries in jars for a long time (won’t say how long! hehehehehehe….) They still smell sweet and look good and remain good medicine. Shelbie, as long as there is no off smell or appearance they should be okay to use. Like NancyLee, I too do not store my dried herbs (elderberries included) in the fridge or freezer, but rather in sealed glass jars. Just a note on making the glycerite…you’ll want to make sure that the water is distiller water. Tap water may cause your glycerite to mold. You would also let the mixture macerate for a couple of weeks (shake daily). I also have friends who heat their glycerite initially to make it usable immediately. Hope we all have flu-free winters! These are good tips, thank you Roxanne! Hi! Why would one make a tincture rather than the syrup? I do the syrup and just wondered if one were better than the other. Hi Kate – the tincture lasts – well, really indefinitely because it is made in alcohol. The syrup shelf life is much shorter. I’ve been making elderberry syrup for several years and give it to my children straight or making homemade gummies with pastured gelatin for the added benefits. We’ve been flu free (and mostly any-illness-free) all the years I’ve been doing it, even with my husband working as a nurse in hospital where there has been significant H1N1. So I’m wondering about the tincture. Is there any advantage besides shelf life? If I get too much syrup in the fridge, I just make gummies out of it to use it up. Is the syrup missing some benefits that the tincture has?? I’m totally open to making the tincture and have no problem getting alcohol to do it. Just wondering. I use the Mountain Rose Herbs berries as well as their recipe for the syrup. Lisa, I’m not sure if there are any benefits over the other. Perhaps a tincture is more cost effective as you use less? And that it lasts longer and is shelf stable? I personally have never made a syrup as I’m a wee bit on the lazy side and vodka, berries, in jar is just really easy. I’m sorry I couldn’t answer your question. I’ll see what I can find out. I use tinctures for a number of other things, especially in pregnancy, so I’m interested to find the answer. I bet frugality is one of the answers, as you suggested, and I’m wondering if it might be more potent too. My problem is that I forget to start things like this. If I get up one morning in December and one or two of my children is sniffly, I would be wishing I had remembered to start the tincture in September! I think the kids will probably like the syrup better – that could be a consideration – but I believe both are effective. I make mine in brandy with honey and a little cinnamon. I like having medicines that are shelf stable and I don’t have any little ones so for just me it would be a waste to make the syrup. Glad to hear what you said about your husband being a nurse and your family protected from the flu – I’m a nurse too, in Obstetrics, and refuse the flu shot. This year I have to wear a mask to “protect” the moms and babies, yet several of my “immunized” co-workers have already had the flu this season and I haven’t as of now. But I was exposed to H1N1 actually diagnosed in a pregnant patient with high fever, etc. last week – we shall see. I love this! And, NancyLee… we just bought a gallon of local raw honey yesterday. Can honey really be used in creating a tincture, especially such as this one? Will the honey cause the tincture to go bad in any way? I am also intrigued with you choosing brandy, vs vodka. May I ask what your recipe is? Thank you! Dear Terra – absolutely honey can be used – it is a wonderfood – honey found in the Egyptian pharoah tombs was still alive and edible when discovered in this century!! I mixed this all up on 8-27-13. And decanted the final product on 11-28-13. Every time I make it – it is a little different…….. Thank you, NancyLee! And, I hope I’m replying to this correctly 🙂 Half gallon?Approximately how much elixir would you say that yields? Taste-wise (regarding elixir of course), brandy vs vodka, what would you say might be better for children? I don’t really have a way to weigh raw honey; do you have a guesstimate as to how many cups? In your opinion, do you think it’s a lot of alcohol consumed of the finished product, or is it very negligible? I appreciate your feedback! Hi Terra – I don’t remember the final amount after decanting – maybe almost 2 wine bottles? The kids aren’t going to like it with vodka or brandy – that would be a good question here for those readers with young children. Do you give tinctures to the little ones? How do they respond? You can also make elderberry syrups without alcohol (and probably with glycerin too) but I haven’t done that. The honey can be estimated (what is the weight of your honey jar?) It’s not exact. You don’t have to weigh the ingredients – I started off with the “folk” method and still use it a lot – basically stuffing a lot of stuff into the jar and adding the alcohol! But more and more I’m weighing the ingredients so the final product will be more standardized. Even that doesn’t guarantee because plants are not standardized in their medicinal effects. You can buy a postage scale very reasonably. I’ve also started using it to weigh my salt for ferments. And it’s excellent for weighing small packages to prepare for mailing at home without hoofing it down to the post office! The tincture is not heated, so any properties that are damaged by heat are left untouched and beneficial. What about the wild elderberry all over the northwest? I make elderberry syrup with berries, water and honey. it’s safe for children, has no alcohol for those who abstain and you can add a cinnamon stick or ginger root when steeping your berries. Once cooled.. press through a strainer, add honey and store in a cool dark place. I keep mine in the refrigerator. Has all the same properties but without the booze. 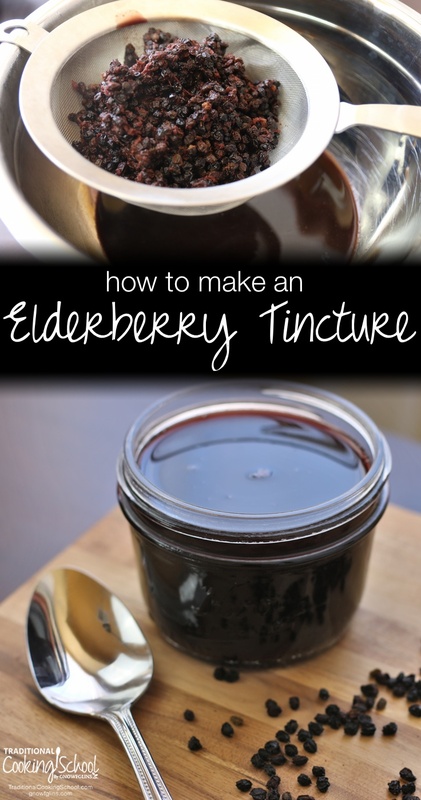 Can you make the tincture with elderberry powder? I’ve been wondering the same thing. I have some powder that I need to use. I made this recipe and then forgot about it. It has been under my cabinet for at least a year. Can I still strain it and use it? Shouldn’t be a problem. If it smells rancid, or you see mold, don’t use it. Alcohol based tinctures are very shelf-stable! It is slim pickins for me on the elderberries and since I was afraid the birds would get all of the berries from our plant, I picked some of the flowers to make my tincture. After I already made the tincture I read that the stems are poisonous. I didn’t remove the flowers from the umbrels before putting them in the jar and covering with vodka. Are the umbrels poisonous? Did I ruin the tincture? Thanks for your help with this. I hope I don’t have to start over, but I don’t want to make my family sick, when I am trying to find natural ways to help them get well. In WNY (Upstate to those inside NYC) it is prime Elderberry season now. Some bushes are still sporting green berries, some have loads of the black/purple berries, and other have been picked clean by the birds for weeks. I have found a few bushes that give me all that I need for Pies/Cobblers and have taken to looking at drying, tinctures, syrups and more. Tinctures are very straight-forward to use and make. In our state (New York) we can get Everclear grain alcohol which is ideal for making Tinctures due to it’s extremely high alcohol content. Now after reading this article and some comments, I just wanted to share some experience I have had with making and adjusting tinctures. Firstly a friendly reminder that anything over 100 proof/50% is flammable – “Firewater”. The vapors can catch if near an open flame. Having said that, you can cheese cloth the lid and let it sit out on a porch or near a window for a short time to evaporate some of the alcohol to concentrate it a bit. You probably don’t want to take out too much of the alcohol though, since some link the liver to not get the full dose with the tincture if the alcohol is not present, as in some glycerine tinctures (unless that is what the aim is for.) Thank the MMJ crowd for experimenting with making tinctures and evaporating for stronger medicines. And we mix our berries into other recipes when we have fresh. We pick, wash, and freeze our Elderberries mainly for later use. *Remember with pies and cobblers it usually calls for 4 cups of Elderberries – however we have always used 3 cups Elderberries + 1 Green Granny Smith Apple to make up the other cup. Stretches it and gives us more pies without noticeably changing the flavor. Just small dice ’em so all fruit is roughly the same size. This is a key factor in years when we can’t find our elderberries before the birds clean them off the stems. The RED Elderberries are the ones that you do not want for anything talked about on this thread. Blackberries progress from green to red to black, but the Black Elderberries that are so healthy don’t get red. FLOWERS turn into BERRIES. Meaning if you harvest all the flowers, they can’t turn into the healthy berries. (Think of it like peppers, You would pinch pepper flowers to discourage energy of making the fruit and focusing on growing more.) However, when you get sticks in the spring from an established plant (your pinky thickness) to start to propagate at home in a mason jar – changing the water every week or so, then the first year you have them they will flower. You are encouraged to pick the flowers to redirect the energy of the plant to forming the roots and further growth and wait for berries for the second year. Remember to have 2 different plants within 100 ft or so to increase your annual berry harvest by a ton! Elderberries are the best. Cruse around in the car or on a bike in the early june/july and find the flowers. These are how we spot our local bushes and revisit in Aug. Thanks for the great article and discussion starter! Happy foraging. My elderberries (two varieties I planted here in TN) do go through a reddish-purple stage before turning black. I pick them when there are black ones present in the clusters. I have found that waiting for them all to turn completely black just leads to them all being eaten by birds or the berries falling to the ground. Just clarifying — my berries do go green-red-black much like the blackberries here. This is so helpful. I’ve picked wild elderberries for the first time this year (I live in Northern Ireland) and am trying to figure out what to do with all of them. I will definitely make some of your tincture. I’ve been dabbling in fermenting. I just made this tincture. Any need to “burp” or just put in a dark cupboard and forget about it? My elderberries have been soaking in vodka for almost a year. Will the tincture still be ok? I forgot about it in the closet ???? Hi Wardee & Friends, I’m going to make this amazing tincture next week for our family. I have read other recipes & some of those recommend daily shaking of the jar during the six week infusing period. Is this necessary. Any advise would be greatly appreciated. Love this site! TY ???? I made this, and my berries really plumped up, they started to get kind of fizzy too…. is it still okay to consume?! My experience has been that elderberry tincture is far more effective than the syrup version. Even if the tincture is years old! The syrup is certainly tasty but far too sweet for my system. I have elderberry juice in the refrigerator from Late summer that smells like it’s starting to ferment and turn to alcohol – just barely ..: is it still okay to make into a tincture? I started to make this tincture one year ago and just now found the jar. It hasn’t been strained yet. Is it still good or is it too strong now?